For the Daring Baker's challenge in June, I cooked some strawberry and red currant jam, but only one glass. 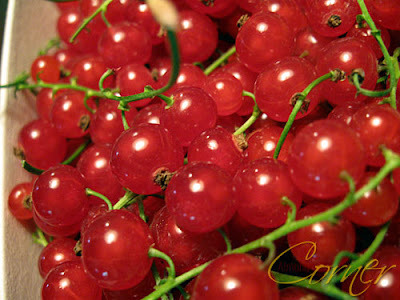 Well that glass got empty pretty soon, because of its wonderful piquant taste, so I thought I must prepare some more red currant jam as long as they are available on the market. 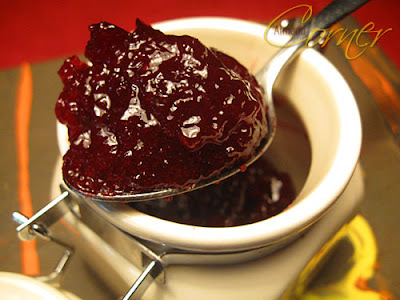 This time I decided to combine it with cherries, that gave the jam a nice deep red colour. Pit cherries. Puree red currants and sieve, after bring it to boil with the sugar and cook for about an hour, add cherries and cook for one more hour or as long as it has reached the desired thickness. Put it into jars and let them cool covered by a blanket over night. What a wonderful combo! A delicious jam.